Stack N' Cook - Your Pressure Cooker's Best Friend! The "must have" pressure cooker accessory for your Instant Pot or any Pressure Cooker! Cook multiple meals together to save time. The included "Steaming Lid" component allows for multi-functionality and let's you steam and cook to create the most nutritious foods for your loved ones. The Healthy and Sensible Choice. Baking, boiling, stir-frying, sautéing, roasting, grilling and stewing all take so much time and effort in addition to your main course that it feels like you are making multiple meals! You can buy expensive and bulky cooking/steaming devices but they take up so much room on the counter and in the cupboard that they hardly seem worth the hassle. 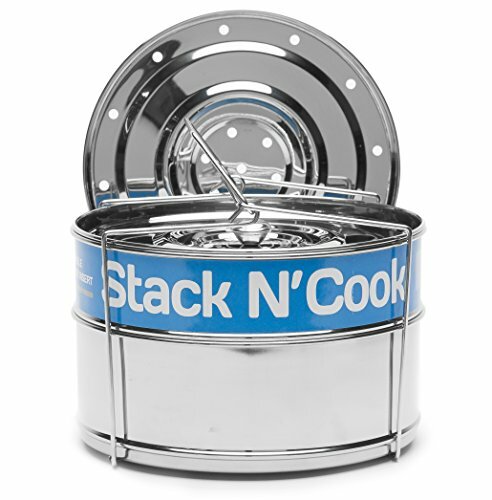 Stack N' Cook gets your food to the table faster with almost no effort at all! Skip the Microwave and reheat multiple dishes without losing nutrients, flavour or texture. Use as a Dessert Pan for Cheesecakes or a Lasagna Pan. 1. Remove stainless steel pans from their handle. 2. Place food in both pans and cover with chosen lid (steaming lid for steaming food, sealing lid for re-heating or pot-in-pot cooking). 3. Place the pans back into their handle for easy removal and insertion of pans. 4. Add water to the bottom of the cooker and bring to a boil. 5. Place the stainless steel pans including the handle inside the cooker and cook as normal. Please Note: The bottom pan cooks slightly faster than the top pan, therefore meats and items that require a longer cooking time are better placed in the bottom pan. VERSATILE and CONVENIENT: Two tier stackable stainless steel insert pans allow you to cook a variety of foods simultaneously. Excellent choice for steaming vegetables, rice, meat, and fish. These are perfect for cooking Pot in Pot meals and recipes. Reheat your food without losing it's original flavour or nutrients so you can avoid the microwave. It is also useful for storing food. TWO INTERCHANGEABLE LIDS: The pressure cooker set includes two lids for multi-functionality. The enclosed steamer lid is designed with holes to perfectly steam your food. The air-tight lid is perfect for cooking or re-heating food. FOOD GRADE STAINLESS STEEL: The stackable steamer insert set is built with durable high-quality food-grade stainless steel to ensure your health and quality is not compromised in the least. FITS 5, 6 & 8 QUART COOKER - The Stack N' Cook stainless steel cooker insert is compatible with most instant pot models including IP-DUO50, IP-DUO60, IP-LUX60, IP-DUO80. Also fits other multi quart (6 quart and above) electric pressure cookers such as Kuhn Rikon, Power XL, Cuisinart, Fagor, Costaway, Faberware, T-fal, Elite, GoWise, Secura, Gourmia.